Andrews North Carolina is located in a serene valley in the foothills of the Great Smoky Mountains approximately 90 miles southwest of Asheville NC and 130 miles north of Atlanta. There is something quite spectacular, even spiritual, about the mountains surrounding Andrews and the valley they cradle. 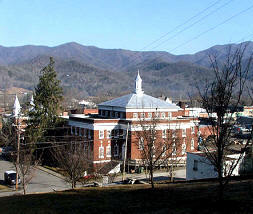 Andrews NC is framed by the Snowbird Mountains on the north, the Valley River mountains on the south and the Nantahala's on the East. If you want a quiet small town getaway for rafting, fishing, hiking or just peace and quiet, Andrews North Carolina will meet your needs. There is virtually no hustle and bustle or nightlife in Andrews. The 466-square-mile county in which Andrews NC is located encompasses 300,100 acres, with 92.363 of that U.S. Forest Service land. The acreage of the county encompasses 8,700 acres of lake, 38,887 acres of farm land and 6,000 acres Indian land. Average Andrews NC temperatures in the summer in the valley ranges from highs of about 85 degrees to lows in the 60s. Average temperatures in the winter in the valley range from highs at 50 degrees, with lows around 20. The area averages about six inches of rainfall each month. Lake Hiawassee and Nantahala Forest offer endless outdoor adventures. Andrews is rich in Cherokee Indian history as well as that of the European settlers from the Elizabethan era. Andrews Art Museum The museum is open Friday-Sunday from 1-5 pm. Call 828-361-8602 for more info. Andrews Cinema showing first run movies 7 days a week. Folk School Concerts Folk School Concerts are open to the public. They are scheduled for most (but not all) Friday evenings at 7:30 pm. The Cabins at Long Branch include 40 acres of private mountain wilderness with trout stream, secluded but close to activities. 2 bd cabins sleep up to 6. Full kitchen, fireplace, central H&A, handcrafted furnishings, deck, rockers, grill, motorcycle accessible. FREE WIFI. $155 night. Secluded creek-front log cabin with hot tub - 3 bedrooms, 2 baths, sleeps 6. Rock or soak your cares away to the sounds of the flowing creek. Gas fireplace, deck with gas grill, video library, hiking trails. $135 night, $800 week. A virgin hardwood tract named after the author of "trees" includes 400 year old poplars with 20 foot diameters. Beautiful walking trails including one of the most adventurous in Slickrock Wilderness. A massive grant writing and fund–raising effort supported by the entire community went into action and the building was purchased in June of 1986 from the First Baptist Church specifically for the purpose of providing a facility for the community to have performing and visual arts entertainment and enrichment. In the years since the purchase of the building, the Valleytown Cultural Arts and Historical Society has provided innumerable arts events for community enjoyment. The Andrews Art Museum is housed within the cultural Arts Center and offers a variety of exhibits and events throughout the year. Mountain Morning Craft Gallery A non-profit co-op under Far West Mountain Economic Partners, was started with the belief that the old crafts and unique skills that have been handed down through the generations are still in the hearts and hands of the people of Western North Carolina. Classes for Adults and children are offered. 911 Main Street in Downtown Andrews. Stop by and get information about where to ride your motorcycle in the Smoky Mountains. Featured roads include the Tail of the Dragon, Cherohala Skyway, Wayah Bald Road, Blue Ridge Parkway, Foothills Parkway, and others. Located at US 74/19/129 on the By-pass in Andrews NC.